If you’re sending a son or daughter off to college for the first time it can be a little nerve racking. You’re trying to get everything ready from clothes, to dorm stuff, to the finances, etc. However, if it’s a daughter you’re sending off, there is the added concern of safety. I don’t want to scare you, but the reality is you can never be too safe, especially if your daughter is going to a city school. We find that our Mace sales actually spike around this time due to parents purchasing a pepper/mace spray for their daughter to take with her when she goes off to college. In fact, if it is a city school it can’t hurt to have guys carry a mace spray as well. First, I should clarify that the term mace is used in the industry by a lot of companies, but none of the products actually have mace in them. Mace was actually taken off the market about 15-20 years ago due to police finding that it was ineffective against humans under the influence of drugs or alcohol. So what is inside mace products nowadays? Products on the marketplace today have either pepper spray, tear gas, or a combination of both. Pepper spray will incapacitate individuals for 15 minutes to 1 hour, including individuals under the influence of drugs and alcohol. Pepper spray causes coughing, choking, nausea, dilation of the capillaries causing temporary blindness, swelling of the mucus membranes causing trouble breathing and burning of the eyes! On the other hand, tear gas is effective immediately causing the eyes to close up and start to “tear”, as the name suggests, along with coughing. So which product should I buy? Most of the products we sell have both tear gas and pepper spray to combine the benefits of both. If you’re looking for a good model for your son or daughter to take to school then the small pocket size triple action pepper sprays are a good option, since they will easily fit into a pocket. If you’re concerned about them jogging outdoors, then we do sell a pepper spray that has an armband. Do Pepper Spray and Tear Gas products have a shelf life? Yes, all pepper spray and tear gas products do have a shelf life. Generally speaking it is two years from the date on the product’s canister. 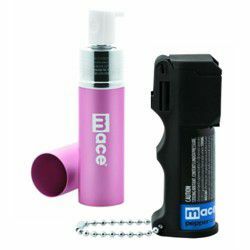 Give yourself and your son or daughter the added safety of a mace spray to take to school. Along these lines, make sure they utilize other best safety practices when walking anywhere late at night, by either walking with others, only walking in well lit areas, or opting for transportation services. Many, if not all schools, have shuttles for students that need transportation at night back to their apartment or dorm.